Tune into EWTN on Monday for the Feast of the Assumption Mass at 8:00 AM and 6:30 PM (EDT). Why? Because in the readings from Revelation for the Feast of the Assumption, the church honors Our Lady as Ark of the Covenant. 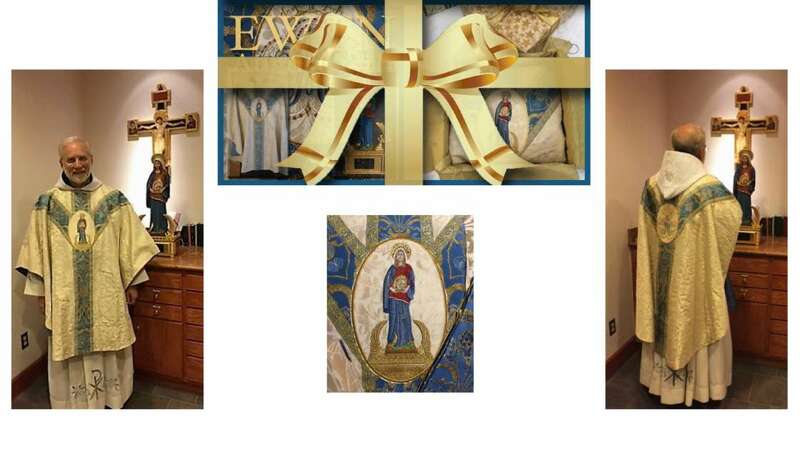 Liturgical vestments of Mary, Ark of The New Covenant have been lovingly designed by Susan Newman of Morning Glory Embroidery and have been gifted to the EWTN Franciscan Missionaries of the Eternal Word in honor of EWTN&apos;s 35th anniversary. The original statue of Mary, Ark of The New Covenant will be present for veneration. It is the fundamental obligation of every faithful Catholic to stand up for the honor and glory of God and the honor of the Mother of God. On Monday, the 15th of August, Feast of the Assumption of the Blessed Virgin Mary, a blasphemous Black Mass is scheduled to occur publicly at the Civic Center in Oklahoma City. Afterwards, another satanic blasphemy and sacrilege will be perpetrated against the Blessed Virgin Mary in the same place. According to news reports, this satanic ritual called "The Consumption of Mary" will include pouring ash, sulfur and blood on a statue of Our Lady. With satanic invocations, a &apos;reverse&apos; exorcism will be performed to &apos;cast the Holy Spirit&apos; out of her. In reparation for these horrific blasphemies, His Eminence Raymond Cardinal Burke will be celebrating Holy Mass and praying a Rosary on Monday in honor of the Assumption of the Glorious and Blessed Virgin Mary. For this reason, let us turn to the intercession of the Blessed Virgin Mary, through the recitation of the Holy Rosary, to storm Heaven with our prayers to make reparation for these sins and blasphemies that further provoke God&apos;s just wrath upon our beloved Nation. Please share this with your family and friends and anyone who loves Our Lord and the Blessed Mother. Now more than ever, we need to storm Heaven with our prayers! So please encourage everyone you can to join Operation Storm Heaven - a History-changing Global Rosary Crusade led by Cardinal Burke to storm Heaven with prayer to obtain a tidal wave of mercy from God for our families, our society, our country and the world! May Our Lady of the Rosary bless you and your loved ones! And may She who is the Mother of Mercy have mercy on our Beloved Nation! Please keep our work in your prayers.